Last week’s Ohio Oil and Gas Association Annual Winter Meeting in Columbus, Ohio was well attended. 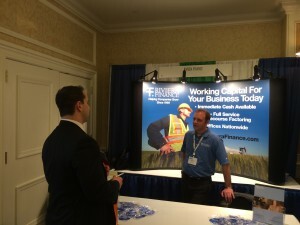 Here, Jason Smith of Riviera Finance is attending the booth and discussing how factoring can play a role for contractors servicing the energy producers. What was realized from Riviera Finance attending the trade show is that there is a growing demand for contractor services by the energy companies as they increase production. While this is good news for the industry, many contractors are having a tough time with cash flow to run their business when waiting for payment from the energy producers. Riviera Finance believes it can provide a solution to the contractors servicing the energy producers by factoring their accounts on a non recourse basis. Factoring accounts can increase the cash flow to the contractor allowing them to meet the increased demands of the energy producers.